This has to be the largest turnout for a Spring Game since we moved into the stadium. Very happy about that. Now, as you may have heard the student section will be moved from the endzone section specifically designed for that purpose to the north endzone because, they say, students asked to move so they could better see the videoboard, among other reasons. I personally hate the idea but we'll see how it plays out; adding insult to injury today we learned that in addition to moving the student section they have also relocated the Rat's Mouth to Lot 5 on the north side of the stadium, conceivably to give students a parking lot to tailgate in and to put them closer to their new seating section. This means the awesome atmosphere in front of the stadium on gamedays is now hidden in the back where no one can see it. It is now also the SECOND time the Rat's Mouth has been moved; it was originally over by Administration/Physical Sciences/Sanson Science but was moved because, among other reasons, nobody could see it. Furthermore, Student Government just passed a resolution in support of building Greek Housing on Lot 5, and although Greek Housing is one of those nebulous things that has yet to come to light at FAU, we've got to be on the cusp of it which means once its built there the Rat's Mouth will have to move AGAIN, likely back to its previous location right in front of the stadium! You know, right where it belongs! Our traditions are being changed at an alarming rate and I'm surprised there isn't more commotion about it. One good change on campus may be having some problems too; the much-touted Atlantic Shuttle that Student Government paid $20k for to take students around off-campus to the stores and to the beach is… sitting in Lot 5. Here's a picture of it at 3:00pm today when, according to its published schedule, it is supposed to be picking up students in front of UVA. This is not the first time I've seen it there (or at A1A Limo, which owns it) when it should be running either. There are no posts on either its Twitter or Facebook accounts explaining that it's not running as scheduled, though it did tweet out that it was running three days ago on April 9th. The question is why is it not running every day it is scheduled? The UP article talks about a soft opening and adjustments for the schedule. And while it has been promoted, the shuttle may be new enough that students don't know it exists yet to ride it so ridership may be low. Aesthetically-speaking, there's really no indication from looking at it that it is intended for FAU students so even if you saw it on campus you may not realize that's something you could utilize. But if that's the case, I hope Student Government and A1A give it a repaint and promote it even harder. I hope that's what's happening here and not that it's sitting there because we paid them and they're not holding up their end of the bargain. That could be an unfair assumption, I know, but it's worth investigating if you've paid $20k for a service that's not being provided. Anyway, let's move onto something more positive. Construction just started so there's nothing else to show you but a fenced off area and some dirt. Over by the Barrier Reef store on 20th and NW 2nd is a new restaurant called Community Table that has a lot of FAU paraphernalia hung up inside. Among other things they do $1 pizza slices and they're open until 2 am on the weekends, which is a plan clearly geared towards students. 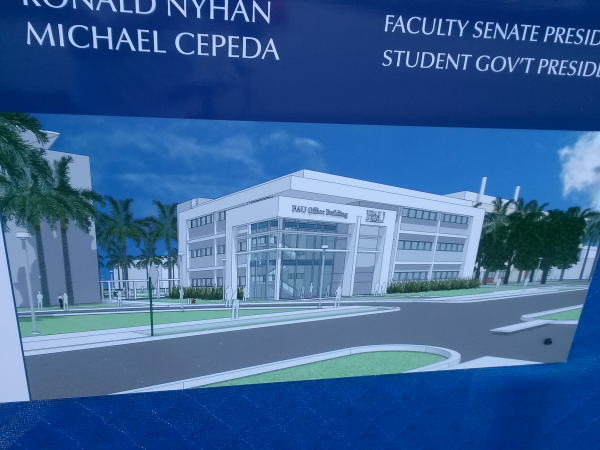 I hope they're successful because we want to see more of this near FAU. In addition, the gas station across from FAU by CVS has gotten a very nice renovation which included a new takeout place called University Pizza. Meanwhile University Park, the massive new student apartment complex on 20th near Dixie, is almost complete. There's still construction going on so I tried to visit at night to stay out of the way of all the work being done there. The place is tremendously impressive and they have been very active on Twitter and in their support of FAU Athletics, including hosting the football staff out to the site and giving them a personal tour. As you already know, they purchased Addison Park and re-branded it as University View and purchased another apartment property on 20th just past Dixie and re-branded it as University Square. We talked about this in a previous entry and the University Press put out an article about it as well. 1) As detailed in this Sun Sentinel article, Investments Limited has purchased the dying Plum Plaza and is currently renovating it into The Shops At University Park (as the new dorm complex is adjacent to the property. There's not a whole going in there right now for students, honestly, outside of a gym, a restaurant and (indirectly) a Delivery Dudes. The Florida Launch - the professional lacrosse team that uses FAU stadium as its home venue - also has an office there. I'll talk more about the plaza in a future entry but essentially my hope is for it to become a nightlife hub for students as well. From the SS article it appears that Investments Limited is on board with the student-centric development of the area and they're even selling a nearby property which they list as "great for (a) student housing project." 2) According to this Action Agenda from a Amrch 23rd City Council meeting, "FAU canceled the joint meeting scheduled for October, 2014 between FAU Board of Trustees and City Council. Staff is waiting for a rescheduled meeting in order to conduct discussions on the overall vision prior to beginning this project." Alright, 2:30am. Time to call it quits.